How Long Do Cereals Last? How long do cereals last? Cereals, generally thought of as breakfast foods, are milled grains. We've broken the cereal menu into hot and cold cereal choices. The grains most often used to make cereals are wheat, rice, oats or corn. We have three main pages here, one for boxed cereals, one for oatmeals and one for grits. Cereal is often fortified with vitamins and minerals thus making it a simple, yet effective meal choice because of the high concentration of carbohydrates that they contain. Add a little fruit and milk to your bowl and you've got the start to a pretty good day. So, explore our cereal pages to find out how long cereal lasts and many more tidbits of information about cereals and ways to extend their shelf life. 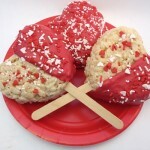 Cereal can also be used to make sweets and delicious desserts, such as these Valentine treats made from Rice Krispies cereal. Some cereals also make a great snack, no milk required. Ever tried Cracklin Oat Bran straight from the box? Or perhaps granola cereal sprinkled on your yogurt to add some texture and crunch? To make oatmeal in the crock pot see our post on crock pot breakfasts. In determining how long Cereals lasts, our content incorporates research from multiple resources, including the United States Department of Agriculture and the United States Food & Drug Administration. In addition, we scoured the web for informative articles and reports related to food safety, food storage and the shelf life of Cereals. Although the Cereals shelf life information on Eat By Date is generally reliable, please remember that individual cases will vary and that our advice should only be taken as an opinion and not a replacement for your health care professional. Please eat responsibly!